The GF naan experiment turned out fairly successful. The naan was fluffy though not quite as large and pliable as desired. 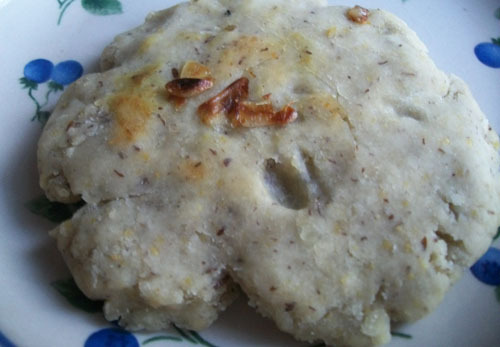 This recipe is adapted from Manjula’s Kitchen with some additional ingredients from this site. For the next attempt I’ll probably switch in brown rice flour in place of sorghum. The final baked product was about 50% thicker than the initial dough mix. It went well with begun bhartha, dal and aloo matar. Add yeast to the lukewarm water in a bowl. Allow to get frothy for around 15 minutes. In a separate bowl add sugar, salt, baking soda, baking powder, xanthan gum and flour and mix together. Next add in yogurt, oil and eggs, once again mixing together. Finally mix in the yeast and water to this bowl. Mix into a moist dough and cover for 4-5 hours. 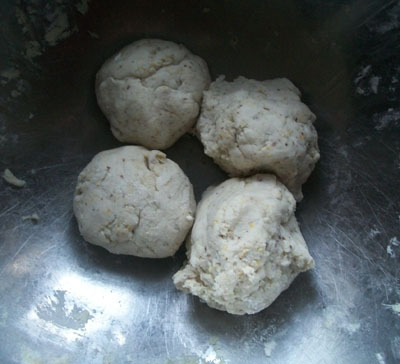 Naan in ball form – two were already pressed out. Preheat oven to 500 degrees. Once at 500, switch to broil. 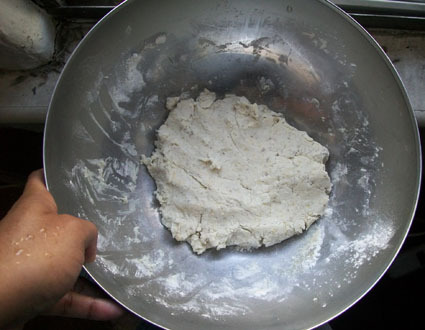 In the meantime split dough into 6 pieces and shape as desired and place on pan. I recommended making them thinner than pictured. I also caramelized 4 garlic cloves, chopped small for extra flavor before putting in oven for about 5 minutes, flipping once. Surface should brown slightly. Once out of the oven brush with butter/butter substitute. What was your experience making gluten free naan? Picture doesn’t do it justice.